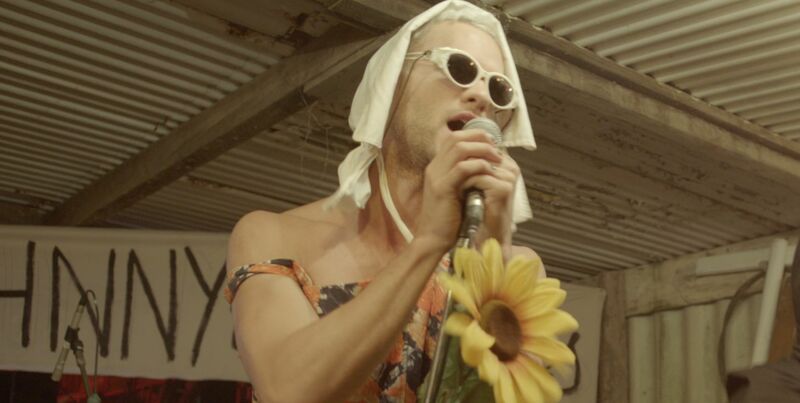 With Johnny Is Nie Dood Nie, writer-director Christiaan Olwagen delivers a refreshing film that is as radical as the Voëlvry music movement that rebelled against the autocratic dictates of the apartheid government and changed the hearts of a generation of South Africans who wanted to break free from oppressive separatism. Olwagen’s enthused adaptation of Malan Steyn’s play Eat Everything, referring to the “Reformed Blues Band” album “Eet Kreef” , is a significant South African film that reveals a truth about our lives that deserves to be seen and will most definitely spark lively debate. Olwagen’s extensive experience as an actor, writer and director in plays, cabaret, comedy, drama, puppet theatre, musicals, physical theatre, television and short films, infuses the film with a vibrant and savvy sensibility, reaping powerhouse performances from a potent ensemble cast. If there’s one reason to see the film, other than for Olwagen’s daring vision and execution, it’s for the outstanding performances by Roelof Storm, Ludwig Binge, Albert Pretorius, Rolanda Marais, and Ilana Cilliers, who crawl under the skin of their characters and bring them to life with passion and sincere honesty. The film vividly examines the impact of the Voëlvry movement on the personal and political development of a generation of Afrikaners, as well as the havoc the Bush War inflicted on the lives of thousands of young army conscripts – the Voëlvry (Outlawed) Movement was a group of South African musicians who rebelled against the autocratic dictates of the apartheid government and allied themselves around the group called the “Reformed Blues Band” (GBB) a deliberate reference to the Reformed Church. The story tells of a group of ordinary people whose extraordinary vision and beliefs challenged the world they lived in during the 80s in South Africa. Their lives as young, drunken rebels – the grandchildren of Verwoerd – saturated in the protest music of Johannes Kerkorrel, Koos Kombuis and Bernoldus Niemand are severely confronted by the Kerkorrel’s suicide in 2002 when they gather for a braai and reminisce about their days as students in Stellenbosch during the time of the Voëlvry tour. This tragedy forces them to redeem themselves and re-examine the bond of love and friendship that united and ultimately divided them. Just as they used music as a weapon to express themselves in a war they had with the autocratic dictates of the apartheid government, so does Olwagen use the film medium as a way to visually tell their story. The bold and full screen titles of the opening and closing credits, as well as the introduction to the characters and timespan, and style of filmmaking reminds strongly of Andy Warhol’s experimental Underground Films of the 60s that brashly challenged perceptions and traditional conventions, as well as the alternative underground movement in South Africa during an era when 1791 men lost their lives as a result of compulsory military conscription. The story opens with Lise (Marais), who is awoken from a dream she had about Kerkorrel and throughout the film, Olwagen uses a free-held Steadicam that evokes the feeling of Kerkorrel watching the events unfold as his soul guides us into the mindscape of the characters. Olwagen’s choices as a visionary are sometimes risky, but ultimately rewarding and meaningful. He tells the story in motion and brings it vividly to life through the lens of DOP Chris Vermaak, who shot the entire film on Steadicam to achieve Olwagen’s theatrical style of rehearsal on set and to execute the director’s vision of continuous movement whilst shooting. One scene captures the turmoil and confusion of the characters chatting at a table by letting the camera continuously circle the event, almost intruding on their space, yet keeping a safe distance. Another scene that stands out is a raucous party scene vignette of 13 minutes, a continuous take that features the full cast, two rock bands, an accordion player, a violinist, an opera singer, and a full university choir. This surreal-fantasy scene metaphorically takes us down Lewis Carrol’s Rabbit Hole and like Alice in Wonderland, a drowsy Lisa encounters the Cheshire Cat, a Mad Hatter Tea-Party, Croquet Ground, flamingos, the White Rabbit, a bottle labelled “Drink Me” and a “caterpillar” smoking a hookah. This signifies Olwagen’s brilliance as a director, his powerful vision overpowers the senses and offers moments of pure genius, giving the film a haunting realism that allows us to quietly intrude on their lives and thoughts; it’s an introspective journey of inner conflict that forces the characters to reveal their emotions. Olwagen effectively balances physical confrontations with gentle intimate moments that results in a dynamic cinematic experience. The film also has a heightened realism where Olwagen uses theatrical devises as exposition. In one of the most important scenes, we find Johnny (Storm) sitting on a sofa in a garden, as if lit on stage, when he is joined by Hein (Binge); it is here where Olwagen subtly probes the essence of what might have caused Kerkorrel’s torment and forced him to take his own life. Forbidden desires and hidden secrets can ultimately destroy lives, and as Johnny Is Nie Dood Nie poignantly reflects upon, is how this impacted on Kerkorrel’s life; it’s very much a reminder of how easy it is to sacrifice ourselves and our sanity for a greater cause. Sometimes, it’s our humanity that ignites a personal war that is never conquered, but lives on in the hearts of future generations. The idealistic life and rebellious vigour of singer-songwriter, journalist and playwright Ralph Rabie, who shot to fame as Johannes Kerkorrel, also lives on in Johnny Is Nie Dood Nie, with Storm perfectly capturing the magnetic spirit and enigmatic passion Kerkorrel had in his role as Johnny. The film will most definitely allow a younger generation to make sense of “the sins of their fathers” to understand the world they live in. Johnny Is Nie Dood Nie is a definite must-see film for discerning viewers looking for escapism that offers an invigorating visual experience with profound food for thought.